Two very popular new fitness aids, the treadmill desk and the desk cycle, have burst onto the scene in recent years, and we often get asked the question of which one is better. Both have their primary areas of benefit, and their drawbacks. Let’s explore. 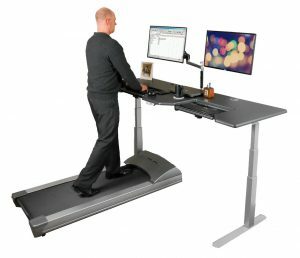 As the ultimate weapon against sitting disease, treadmill desks not only get you upright, but they also get your calf muscles working, causing more oxygen to be pumped to the brain and kicking us into high gear in terms of work output, mental outlook, and increased basal metabolic rate (resting heart rate). Even at the slow waltzing pace of only 1 to 2 mph that most treadmill desk users walk at, your caveman DNA will kick in, telling your brain you’re on the hunt. Cognitive ability and ability to concentrate increases, while susceptibility to distraction decreases (you’ll tend to ignore social media and stay focused on your tasks). Even your mental outlook improves when you’re on the hoof. And that’s just the mental stuff. Physically, you’re providing your body with a needed break from crunching your lower spine at a 90-degree angle, reducing circulation to your lower extremities, and falling into a “computer hunch” posture. When mixing up modalities, it is best to walk right after you’ve been standing for an hour or two, to leverage that “second heart” in your body, the calf muscle, to pump blood that’s been pooling in your legs back up again. It’s also helpful in reducing the chance of developing varicose veins, foot pain, and low back pain for standing too many hours a day. 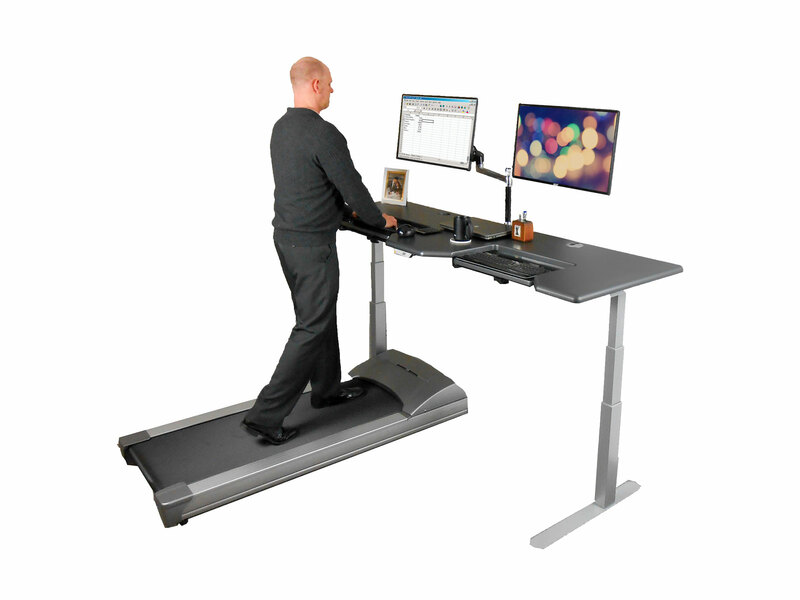 And, of course, metabolically, the benefits of working while walking on a treadmill desk are well studied and well publicized, with known improvement in everything from blood pressure and cholesterol to blood sugars (think diabetes and obesity) and triglycerides. 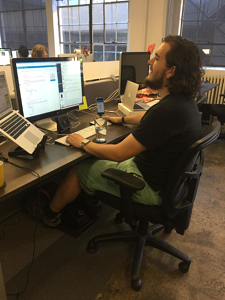 On the downside, treadmill desks take a lot more space and cost a lot more than a cycle desk. This is the kind of equipment you don’t want to buy on the cheap, as dealing with a burned out treadmill is a costly hassle, and contending with one that isn’t ergonomically sound can lead to new problems with muscle strain. But that’s why you’re on this site—to learn about proper equipment and ergonomic setups, whether for a standing, walking, or pedaling workstation. To learn all about treadmill desk options, be sure to check out our Integrated Treadmill Desk Workstations Comparison Review, or if you already have a standing desk you want to use, read our Standalone Office Treadmill Bases Comparison Review. 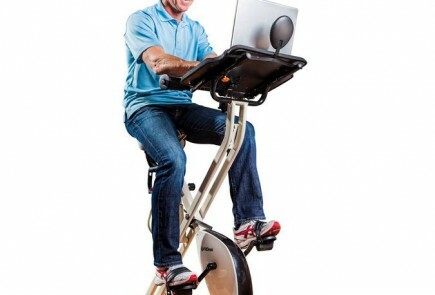 People most attracted to the concept of cycling at their desk are typically cycling enthusiasts. In fact, many of the products we’ve reviewed in our comprehensive round-up of Desk Cycle Reviews and Bike Desk Reviews are called “pedal trainers” or “pedal exercisers” because cycling aficionados want to keep cycling even when they’re not on their bikes. These devices are also more apt to take you into cardio heart rates, if that’s your thing. 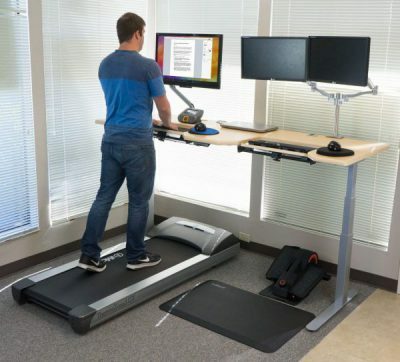 Where treadmill desk users like to keep it low key, not sweat all over their desks, and be able to type with normal proficiency, desk cyclists may be more apt to go into full sprints while at their desks. On the downside, where walking and talking, thinking, or typing are very natural things to do at the same time and don’t take long to get accustomed to, cycling is a different story. Moving your legs in a circular or elliptical motion requires some concentration, especially as intensity increases. Most users find they can cycle while consuming content (videos, reading, etc.) but not while they’re typing. One issue is the body’s gyrations, but the main issue is the ability to split concentration between the mental and physical tasks. As your heart rate reaches the cardio exercise level, you’ll not only start perspiring, but your cognitive abilities will also begin to degrade. Optimal cognitive function is in that sweet spot between total rest and total exercise, where you’re getting movement but not raising your heart rate into the exercise zone. As experienced treadmill desk users like to say, “if you’re sweating, you’re doing it wrong.” For this reason, we know that many users tend to hit the pedals in between typing sprints. When they type, they simply pause the pedaling action. So, depending on the kind of work you do, this may or may not be a major consideration. Treadmill desks are backed by peer-reviewed studies that have time and again commended their benefits to health and productivity. A recent study featured in the scientific journal PLOS ONE involved an intensive year-long experiment with 43 test subjects. The evidence in favor of bike desks is comparatively scant. We did find a quick study involving 13 subjects—but the experiment lasted less than a day. Not the exhaustive research we were hoping for. What we did find was that the subjects’ typing accuracy did decrease somewhat during the 30-minute cycling session, though not by a drastic amount. Another study with 18 full-time workers over four weeks showed slight promise that bike desks could be a big hit at the office, judging by the subjects’ enthusiasm. One of the best studies we’ve seen to date, from the Indiana University-Purdue University Indianapolis, actually compared productivity between sitting to standing to walking to cycling. See our guest blog post by the professor behind the research, Dr. Michael Sliter. As in all the categories we cover in our reviews, there are good products and bad in both the treadmill desk realm and in the desk cycle / bike desk arena. Our advice? Do your research well before putting your money down, and above all, aim for a truly ergonomic setup. An improper setup will not only be a poor experience, leading you to use the equipment less—or worse, stick it in the garage—but it could lead to repetitive strain injuries, poor posture, and other physical ailments, as well as reduced productivity. Ergonomics and solid, well-designed equipment are key for success. In speaking with thousands of treadmill deskers and desk pedalers over the years, we’ve learned that good equipment choices and good ergonomic setups are the primary factors in early adoption turning into lifelong habits. We offer a couple of helpful guides in this regard. If you’re thinking about a treadmill desk, be sure to read through our guide to What to Expect When You’re Expecting Your First Treadmill Desk. If your cup of tea is more like a desk cycle or bike desk, check out our primer on How to Set up an Ergonomically Proper Desk Cycle.